When you are in Rome……..well when you are in India, it is advisable to be aware of the sensitivities of Indians. Indians are generally very polite and will not tell you directly if you do something that offends them. 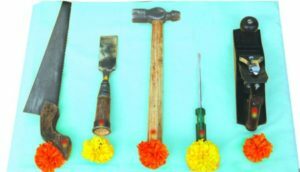 They will not take offense either unless it is PDA (Public display of affection in in or near a place of worship or educational institute), but following these protocols will elevate you in the minds and hearts of Indians. Remember that a ‘Guest is God’ in India – the term comes from the Yajur Veda, an ancient scripture. Following are 10 ‘Do’s and ‘Don’ts’ categorised simply, by hands and feet and your neck! I have not followed a strict list of Do’s and don’ts. Some explanation is necessary; as to why you do and do not do certain things so do forgive the license. Hygiene – You use your own fingers to eat. When you eat with a spoon, there is no control over how many people it is being used by. Temperature – The temperature of food that is right for your fingers is right for your mouth. You will not end up burning your mouth too. Safety – If there is something in your food that does not belong there, perhaps a sharp piece of bone, your fingers will be able to sense it while cutlery wouldn’t. Of course, if you are using cutlery there is no need to wash your hands. 2) Use you right hand to eat – The left hand is used for ablutions hence the right hand is used to eat. Unless of course you are left handed. “The soul in me bows to the divine cosmic soul in you”. While you can offer a handshake, some conservative women might not take your hand and offer a Namaste instead. Do not be offended by this since the person is giving you a ‘divine’ greeting. 4) Public display of affection – I did not want to create more anatomical categories to put in my list of Do’s and Don’ts – hence PDA finds its place here with the very simple statement – In India when in public, keep your hands to yourself :). Indians are very sensitive about promiscuous and even affectionate behaviour since they believe there is a time and place for everything and one must not unduly influence the young and children – a sort of social parental guidance. PDA is an absolute no go in or near places of worship and educational institutes. 5) Hugging Protocols – It is perfectly ok for people of the same gender to hug socially, but not people of opposite genders. Men and women can greet each other with folder hands or handshakes. Women working in corporates and exposed to globalisation are inclined to shake hands. In the rural and more conservative households, you will find ‘Namaste’ is more commonly used. Note though that with more exposure to the West and following leads set by Bollywood, Indians are becoming more open about PDA and you might find Indians doing it. It does offend the sensibilities of the traditional though. In India, feet are regarded as unhygienic (unless you know the person has just washed their feet). The rationale behind this is that you walk the earth on your feet and your feet or footwear could have trampled on many unclean things whilst you were not looking. teachers by bending down to touch their feet. Respect is accorded not because their feet are clean but because their feet are unclean and it is because you respect them that you are prepared to bow and touch their feet, humbling yourself. By doing this you are effectively elevating them. The other rationale is that the feet symbolize a journey and elders and spiritual leaders and teachers have travelled far and collected wisdom. Even the dust on their feet is symbolic of the wisdom and knowledge collected. Hence the prevalence of the gesture of touching the feet of those deemed deserving. In turn the elders bless the young and many touch the feet of those deemed deserving to seek blessings. As a foreigner you wouldn’t really be expected to touch the feet of anyone so have no worries about that, but if you truly felt respect for someone elder (usually significantly elder) and did it, your status in Indian eyes would be elevated to that of a demi-god. There is another form of according respect and that is to kneel down and place your forehead on the feet of the one being respected. This is usually reserved for the very spiritually accomplished and is a higher form of respect than touching the feet. computers get the works. When a farmer buys a spade, he worships the spade before he uses it. It is a matter of respect, humility and gratitude and not a mere ritual. You will find that when Indians approach a play ground or a stage to play or perform, many of them will touch the ground or the stage as soon as they are on it, then touch the hand to their forehead and chest. It is a worship of the ground or stage and the seeking of a fair victory. The gesture of touching the object and then touching the forehead and heart is also to say ‘May all three, the object, my mind and my heart be in harmony’. If a Hindu finds a coin on the street or drops a coin, she/he will pick it up and touch it to the forehead and chest because money is the Goddess Lakshmi and needs to be respected. 1) Do not enter a house with your shoes on – Take the cue from the host. Some families do not mind you wearing the shoes inside their homes, so it is best to ask. If you see the host removing their footwear at the entrance of their homes or as soon as they enter, follow suit. 2) Do not keep your feet on tables or chairs, especially when at work and still wearing your footwear. To Indians, most things are God. Your desk is a place of worship since work is worship. Books are the manifestation of the Goddess of learning ‘Saraswati’, and you keep books and papers on your desks and tables. Hence keeping your feet on tables and desks is extremely disrespectful. You do not keep your footwear-clad feet on chairs either, because people sit there. 3) Do not touch money or books with your feet-If your book or money falls down, NEVER use your feet to move or retrieve it. Indians, being very polite will not say anything if you do, but it will be considered ‘uncivilised’ behaviour. 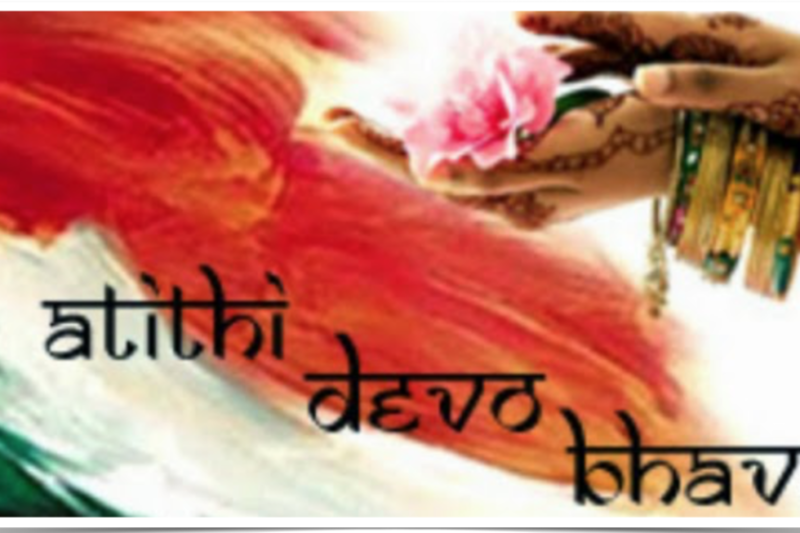 Books represent Saraswati, the goddess of learning and money is Lakshmi the goddess of wealth. 4) Do not touch food with your feet –If there is any food or even a package containing food and if you need to move it, do not use your feet. Food is God too and highly respected. NEVER keep your feet or footwear on a dining table. There is one more Don’t and it has to do with neither hands of feet but the neck :)! 5) The garland protocol – When you are in a function, or you arrive as a guest and you are garlanded ( A garland of flowers is put around your neck as a mark of respect), the following protocol must be observed. Accept the garland but as soon as it is put around your neck, take it off and either hold it in your hand or place it somewhere where it can be retrieved later and taken home. Do not toss it away. If you wish you can leave the garland on for perhaps 5 to 10 seconds to show your acknowledgement, then remove it. It is a matter of humility to do so. If you keep the garland on you are considered pompous. Most Indians do understand that foreigners do not know this and keep their garlands on happily for hours. This could result in a few giggles behind the back of the ‘pompous’ :). But if you do take it off as soon as it is put around your neck, score one for you :)! Note that in the picture, no Indian has informed Prince William or Kate about the Indian protocol. Neither has anyone from his advisors team. 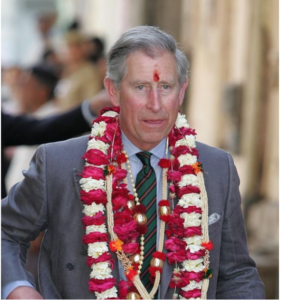 Here is a picture of Prince Charles on an earlier visit to India, blissfully unaware of the Garland Protocol :). Cultural awareness can definitely lead to better relationships since host cultures are always elated when a foreigner is aware of and observes protocols.